Our product range includes a wide range of pp flange end ball valve and plastic threaded ball valve. In line with clients' variegated requirements, we bring forth a distinguished collection of the PP Flange End Ball Valve. There are five general body styles of ball valves: single body, three-piece body, split body, top entry, and welded. The difference is based on how the pieces of the valve—especially the casing that contains the ball itself—are manufactured and assembled. The valve operation is the same in each case. 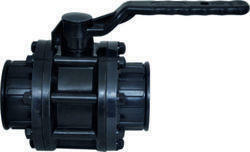 Offered in the market in different sizes and shapes, these Plastic Threaded Ball Valve have the durable handle. Professionals make these valves very precisely by following global norms. Our offered valves are accurate in finishing and show longer life performance. Easy to use, these ball valves are supplied in the market at affordable price.